Blog What Can I Do About Bad Breath? WE ALL KNOW THAT FEELING… you wake up in the morning to the sun shining, birds chirping and happily lean over to your significant other to say hello! Instead, you are greeted by the horrible smell of morning breath. Or maybe you run into friends after work and suddenly become conscious of that bad taste in your mouth. Have you ever been at the gym in the early morning and smelled bad breath from the guy on the treadmill behind you? We’ve all been there! Unfortunately, bouts of halitosis, or bad breath, are pretty much inevitable. 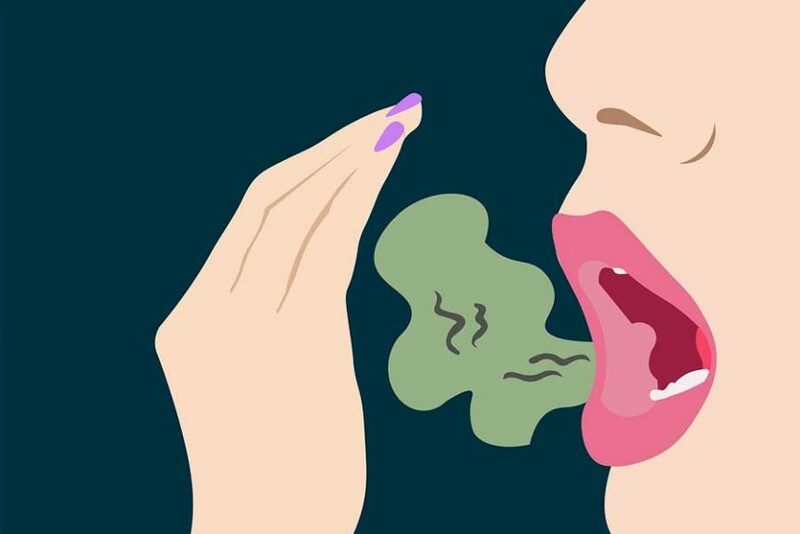 Today we’re going to explain why that is, what causes that nasty smell and what you can do to keep bad breath at bay! Clean your teeth after every meal! Brush, floss, and pop in a piece of sugar-free gum for good measure. This will eliminate food debris and bacteria from your mouth and prevent bad breath. A clean mouth is a fresh mouth! Choose breath-friendly foods and beverages! Water washes away food debris and increases saliva flow in your mouth, protecting your teeth and mouth from bacteria. Healthy food choices such as carrots, celery, and apples are high in water content and actually work as a natural toothbrush, scrubbing plaque bacteria from the surfaces of your teeth. Sonicare the toothbrush company is coming out with a halitosis meter for individuals. It will come to the USA in the fall of 2017. You can blow into it and see if you have bad breath. If you register a high numeric value you can take action, brush teeth, mouthwash, rinse with water etc. Then test again and see if it is below the offensive score. The meter is small smaller than an asthma inhaler and can be carried around in a pocket. You could take it with you and check your breath before an important meeting or before that interview for the new job. To make your morning breath less offensive, follow a good oral hygiene regimen. By brushing and flossing your teeth before bed, you’re giving bacteria less food to munch on, which will help your breath be better in the morning. DON’T FORGET the gum! Remember chewing gum containing xylitol will help with bad breath. Dr. McOmie recommends keeping some Ice Breakers Ice Cubes on hand for after meals when you can’t be somewhere to brush. It not only fights bad breath but also fights cavities. Everything that fights bad breath also fights tooth decay. If you keep bad breath at bay then you are probably going to remain cavity free as well. If the bad breath you are experiencing just seems to keep coming and it is not from your diet, you could have dental disease. Periodontal disease can cause a certain unique smell on a persons breath. A decayed tooth can harbor those nasty sulfur-containing compounds and make your breath smell like rotten eggs. An abscessed tooth that needs a root canal or extraction can be a source of the smell. The good news is we can help! All of those things are correctable in usually one short visit to our Chattanooga dental office. Our patients’ smiles make it all worthwhile! Give us a call 423-899-1112 McOmie Family Dentistry we are here to serve you!